Companies that want almost all of the new features Microsoft is cramming into its Office 365 productivity service can now get them via a new subscription the company will launch on Tuesday. Office 365 E5 costs $35 per user per month, and includes a smorgasbord of new features. Chief among them are new capabilities in Skype for Business, including the ability to broadcast teleconference meetings to thousands of employees and allow people to call into a group teleconference managed by Microsoft's software. Skype for Business is essentially a rebranding of the company's Lync communication software, which Microsoft launched earlier this year. Tuesday marks the general availability of features including a PSTN Conferencing service that lets users dial into a meeting being held using Microsoft's communication service. E5 subscribers also get a new Cloud PBX feature that lets IT administrators replace on-premise PBX systems with a cloud-based management portal provided by Microsoft. Microsoft has offered PBX services through its Lync and Skype for Business Server products for several years, but Cloud PBX is a fully managed system that doesn't require company administrators to provision and manage a server whether that's on-premises or in the cloud. Office 365 subscribers can pay extra for PSTN Calling, a feature that lets them provision phone numbers for employees so that users can dial out from Skype for Business, without having to pay for a traditional landline or VoIP phone provider. E5 subscribers will have to pay $24 per user per month for a plan that includes international and domestic calling, or $12 per user every month for a domestic-only calling plan. Subscribers to Microsoft's lower-cost E1 and E3 plans can also buy into the feature, but they'll have to pay extra for an add-on bundle that includes Cloud PBX. According to Zig Serafin, general manager of Skype for Business, all of these features are designed to help companies get away from audio conferencing and telephony systems that they have to cobble together from multiple vendors today. The new features were available in beta earlier this year, and Serafin said that over 4,000 organizations worked with Microsoft to take them for a spin. 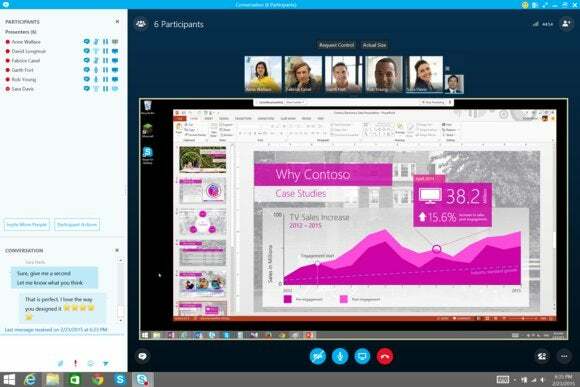 While the new Skype for Business functionality is the flashiest new feature of the E5 subscription, companies will also get access to new analytics features including Microsoft's Power BI Pro service (which ordinarily costs $10 per user per month) and the new Delve Analytics feature that helps users see how they connect with and compare to their co-workers. As with all things Microsoft, the company's volume licensing program can apply, so companies who want to put a large number of users on the new plans should be able to get a discount from Microsoft. Companies that have an existing Office 365 subscription can pay for "step-up" plans that will let them pay the difference between their current plan and a new, more expensive subscription.